A trip to Hyderabad – just for its food! Indian non vegetarian food has many exciting offerings in the city of Hyderabad. Early in the morning for breakfast kulchas and sheermal are eaten with nihari (also called nalli nihari) which are lamb trotters and tongue that are cooked through the night. Qabooli is a khichdi of rice and kabuli chana which is eaten with keema. The distinguishing part of Hyderabadi Kachche Gosht ki biryani is that the meat almost disintegrates while the rice remains firm. 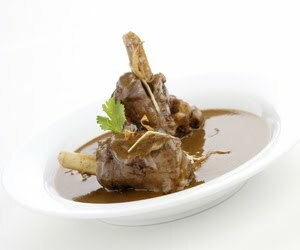 The taste of gravy or ghee does not dominate, only irregular staining of saffron gives it a unique taste. This dry biryani is eaten with a watery onion raita called boorani. Another speciality is the Haleem, which is a finely ground paste of wheat and meat spiced delicately. Hard boiled eggs ensconced in minced meat – the nargisi kofta – are so called because when they are broken open, the golden yolk surrounded by egg white against brown meat background resembles the nargis flower sprouting from the bare earth. Indian non vegetarian repertoire extends to uses of many types of meats in many different courses. Chakna (a dish of offal), Dalcha (lamb stewed with beans and tamarind), Lukmi (small square pastries filled with spiced meat and fried), Mirchi-ka-salan (long large chilies cooked in a fiery masala), Bhagara-baingan (whole slit brinjals cooked in a thick masala of coconut, groundnuts, sesame seeds and tamarind) are some more of the Hyderabadi dishes that have left a distinct mark on a connoisseur’s palate. Vegetarians do not consume eggs could probably enjoy a Hyderabadi sweet dish – the very sweet, ghee fried bread pudding generously laced with almonds (called shahi-tukda in the north) is known as double-ka-meetha in Hyderabad (double for double roti which is bread which forms the base for this sweet). Badam-ki-jali is a latticed sweet made from almonds, and those who are looking for Indian non vegetarian desserts can enjoy andon-ki-peosi is a baked mix of eggs, khoya, kesar and sugar. To summarize the Hyderabadi cuisine one can say it is a superb example of imaginative use of local ingredients to create totally new dishes. Tandoor does give us some tasty bites that make the collection of Indian non vegetarian snacks really proud. Modern day tandoors for home use or restaurant use are operated on electricity or gas. Only a few of us these days, however, are lucky enough to have our own charcoal tandoor. Barbecues can be pretty good, especially where cooking can be done over a grill that lets food juices run onto the burners or coals. The effect is not quite that of the tandoor, but the resulting flavour is acceptable. But there is another technique to make Indian non vegetarian snacks and that is by frying them. It might sound like we are stating the obvious but it’s so true…that the world loves deep fried food! Even if we are aware of the implications of having too much oil in our daily diet, our taste buds clamour for tasty and crisp fried foods. Now that times are changing the awareness about having less oil in the diet is becoming more evident. The emergence of microwave cooking has brought in a new wave of healthful modes of preparing food and it is justified because in this sedentary but stressed lifestyle of today it is better to feed the body what the heart will need to remain fit and ticking. But then remember I said that the taste buds need to be tickled now and then? Nothing wrong with that provided it is once in a blue moon affair and exercise is treated as a serious daily activity. Here are some recipes of Indian non vegetarian snacks that come from the kadai. In a bowl mix 250 grams mutton mince, 1 teaspoon ginger-garlic paste, 2 chopped onions, ½ tsp red chilli paste, 1 tablespoon cumin powder, 1 teaspoon pepper powder, 1 tablespoon garam masala powder, ½ teaspoon turmeric powder, 1 teaspoon red chilli powder, ½ cup breadcrumbs, salt. Make a thick batter with 6 tablespoons gram flour, salt, water, a pinch of red chilli powder. Make marble sized mutton balls. Dip in the batter and deep fry in hot oil till golden. Drain on paper and serve hot. Marinate 1½ inch cubes of 600 grams surmai fillets for 20 minutes in ½ cup malt vinegar. Drain, pat dry. Whisk 1 cup gram flour, ½ cup dahi, 1 egg, 1 tsp ajwain, salt, 1 tablespoon lemon juice, 1 tablespoon red chilli powder, 4 tablespoons ginger-garlic paste. Add fish, marinate for 20 minutes. Deep fry few pieces at a time, in hot oil, till brown and crisp. 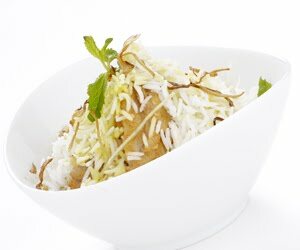 Drain, sprinkle 1 teaspoon chaat maala, serve with 8 lemon wedges. As we progress we will also dwell on the techniques of cooking Indian non vegetarian snacks in the microwave. Till then, check out some more recipes of fish starters: Chilli Fish Bhajji, Crispy Fried Fish, Fish in Banana Leaves. Another hot day, and I’m back in office with work…the mercury is just rising like anything and not even half the year has passed, its at the top notch! I’m sure the kids also are having a tough time coping with the heat alongwith the exams! Yesterday, the whole day went in shooting a commercial for a rice brand. Shoots are always a fun, though a bit tiring. My colleague also had an event in Kurla where he had a cooking demonstration for the Women’s Club. 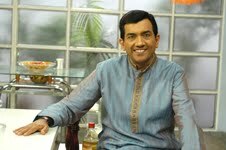 The food that he cooked was pure Jain and the Kutchi Gujarati women just had a gala time with his cooking! As for the coming week and the months ahead, the travelling time of the year is already here. A very busy schedule lined up for the next six months where I will be travelling extensively to different parts of the World for various events. Shall keep you all posted and updated about this as and when it happens. To begin with – a trip to Ahmedabad by the end of this month for crowning of the Gujarat Kitchen Queen. 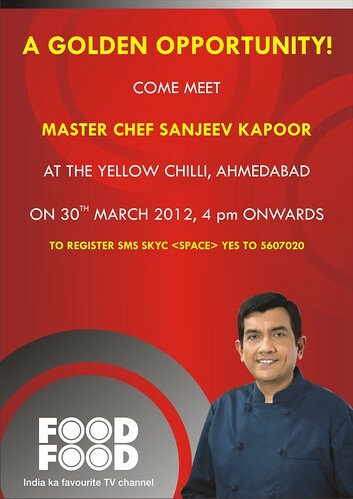 Just a reminder to all of you: the event is at The Yellow Chilli, Ahmedabad on March 30, 2012 from 4.00 pm to 7.00 pm. Hope all of you have sent your best recipes. 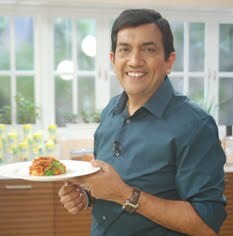 All the best to all of you and I shall meet all you enthusiastic foodies soon! Next in line – The Varli Food Festival in New York on April 5, 2012 where I will be having a cooking demonstration. Looking forward to this amazing time where I’ll get a chance to meet other renowned chefs as well as foodies. Too excited for sure! Something more – I’ll be travelling to Ahmedabad by the end of this month for crowning the Gujarat Kitchen Queen. The event will take place at The Yellow Chilli, Ahmedabad on March 30, 2012 from 4.00 pm to 7.00 pm. So, will be expecting an ever enthusiastic crowd as always, this time as well. ‘Hu awanu chu tamara gaam ma,’ see you all there! 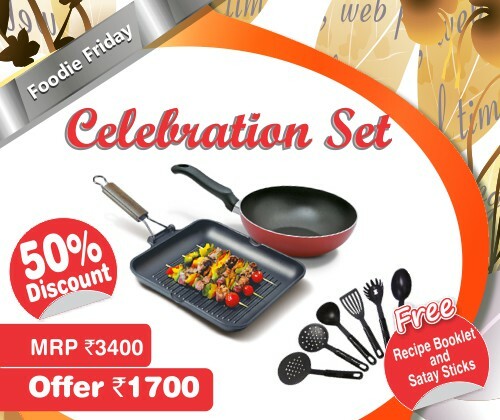 Discount of Flat 50% on MRP and some free gifts. FoodFood Event, a photo by Chef Sanjeev Kapoor on Flickr. Finally the summers have arrived with Holi…so here’s wishing one and all a very Happy and a safe Holi! Make it bright and colourful with natural colours!!! Saturday, March 10, 2012 will have me attending a Dialogue on Future of Power conducted by Brahma Kumaris in Juhu. The event surely includes some of the other notable personalities like Prahlad Kakkar, Subhash Ghai, Kishore Biyani, Poonam Dhillon, Bharat Dabholkar, Sanjay Jumani, Suresh Prabhu, Dr.Indira Hinduja, Pritish Nandy, Shaina NC, Hrithik Roshan and the likes. Looks like it’ll be quite a spiritually exciting time with all these like-minded and successful people! Then shoots again! 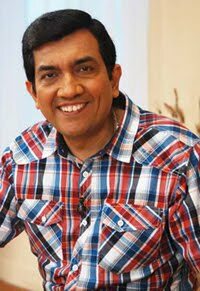 Sanjeev Kapoor’s Kitchen’s next schedule is being lined up next to next week…so, will be getting down to research and development alongwith my team for some new and innovative recipes this time as well!